Train to be the best-in style-on the Pink space Flex motorized folding Treadmill by Sunny health and fitness. Dash on the roomy running deck that is equipped with shock Absorption technology, which minimizes joint impact during workouts. Reach speeds between 0.6mph and 8mph on the incline Treadmill by taking advantage of the 2.5-Peak horsepower motor. 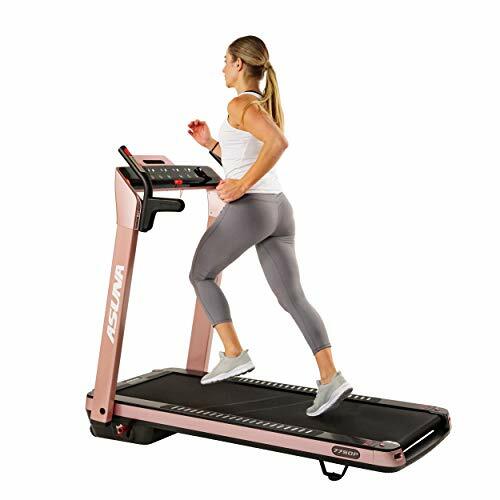 Increase the intensity of your workouts with 12 levels of incline on the motorized Treadmill. Mix up your workout with the 8 program presets, which are guided exercises that automatically adjust speed and incline. View your workout data such as duration, calories burned, steps taken, distance, speed, incline, and heart rate data all at the same time by using the 6 bright LED screens on the console. Make rapid adjustments to your workout with the quick buttons that adjust both speed (3mph and 5 mph) and incline (level 3 and level 5). The Treadmill also has the ability to display imperial and metric units. 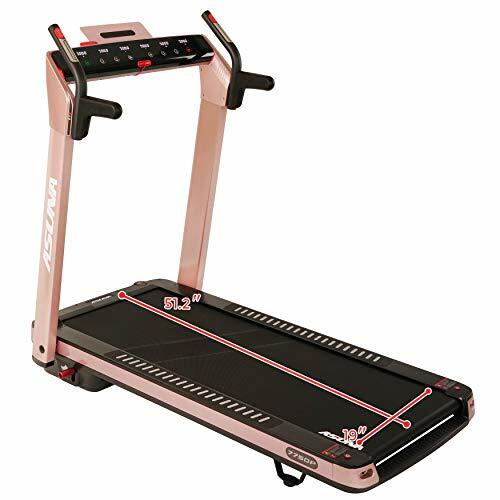 Use your favorite personal devices on the home Treadmill with the large tablet holder. Charge your device using the on-console USB Port. And play music through the built-in speakers by connecting a device to the AUX input. The low-profile, foldable Treadmill supports users up to 220lbs. Fold the Treadmill after your workout to save space. Sleek LCD console - 6 separate LED screens display calories burned, duration, heart RATE, steps taken distance, speed, and incline-all at the same time. 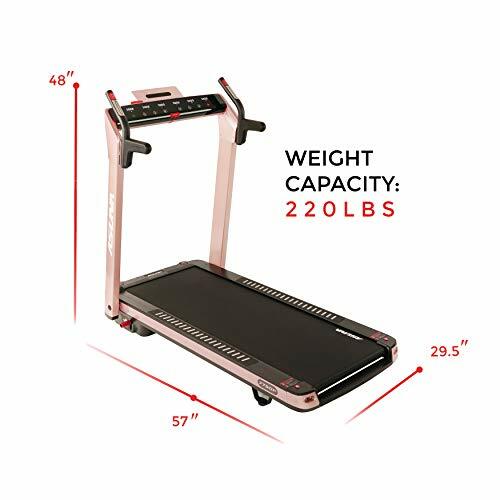 Quick buttons adjust speed to 3 and 5 mph Large running deck - 19L x 51.2W in. Running deck with shock Absorption technology to minimize impact on joints while running. Running deck supports up to 220lbs. Performance - 2.5-Peak horsepower motor can handle speeds up to 8 MPH. Automatic incline (12 levels) increases the intensity of your workout. Customize your workout with 8 predesigned workouts Easy storage - portable treadmill can fold flat when not in Use. 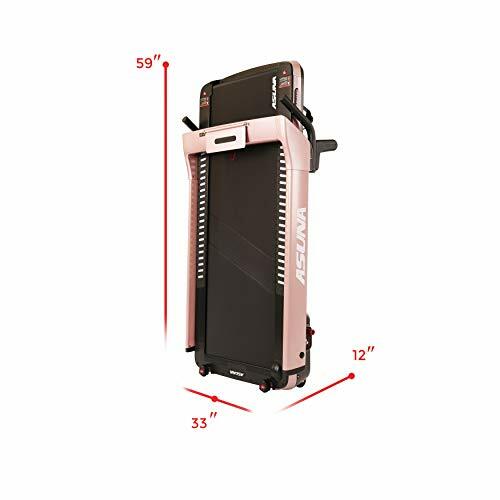 Easily move the treadmill by using the transportation wheels Tablet holder- large tablet holder. Charge your device during workouts via the on-console USB port. Connect a device to the aux port to listen to your favorite tunes through the treadmill's speakers.